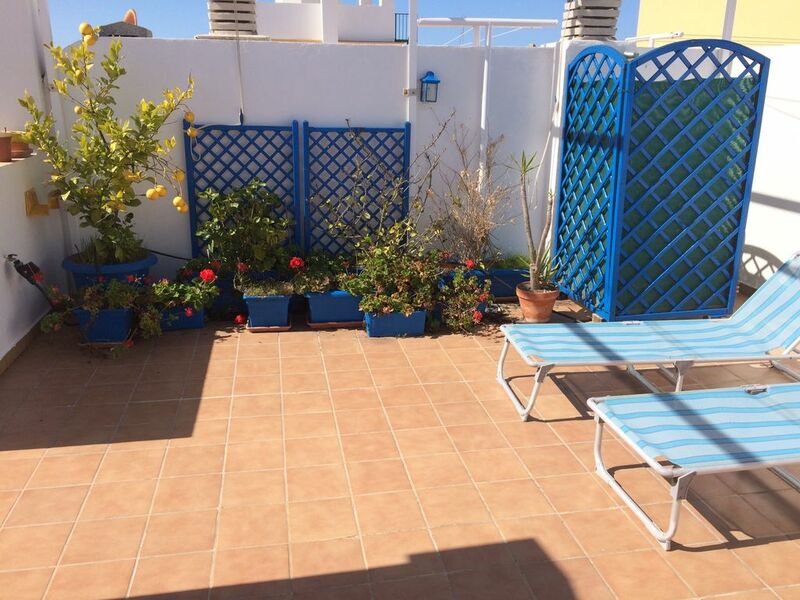 Cozy apartment located in Costa Ballena, one of the most advanced tourist centers in Europe. Located very close to the beach (100m) and facing south, it has 2 bedrooms; Living room with TV, fully equipped kitchen (washing machine, dishwasher, refrigerator, microwave, ceramic hob, coffee machine, toaster, crockery and household goods). The apartment has a living room with a sofa bed, ), Bathroom (shower, washbasin, toilet and bidet). It has a terrace of 17 m2, partly covered with wooden roof and awning, communicated with the living room and equipped with table and 6 chairs of teak wood, ideal for breakfasts and meals in the sun, and a solarium terrace of 35 m2, decorated with Numerous plants, with a shower of hot water, awning and hammocks where you can sunbathe. It has central air conditioning (hot and cold) as well as ceiling fans in bedrooms and living room. The building has communal swimming pool and underground garage with direct access in elevator to each floor and around the same (less than 1 minute walking) bakery, cafeteria and a small supermarket (open in summer). For large purchases, the resort has a large supermarket at the entrance, as well as shops, pharmacy and numerous bars. The urbanization, due to its tranquility, is ideal for resting and long walks, both for its magnificent white sand beach, the lakes and the many garden areas with which it counts. It is also possible to rent bicycles as it has a bike lane throughout the urbanization. For golf lovers it has one of the best golf courses in Cádiz, designed by José María Olazábal, with 27 holes that allow you to enjoy up to 3 different courses. And for those who seek more hustle and have a vehicle have, 5 minutes, picturesque villages such as Chipiona, animated as Rota and the incomparable Sanlúcar de Barrameda where you can enjoy the wonderful gastronomy of the area, both in its numerous bars and in the frame Incomparable from Bajo Guía, where you can taste magnificent fish and seafood accompanied by the wines of the land, sitting on the banks of the mouth of the Guadalquivir. And a little further away (20 minutes) you can visit two great villages: Jerez, famous for its wines and wineries, and the Port of Santa Maria with a great gastronomic offer. Javier es muy amable y el ático está muy cerca de la playa. Tiene todo lo necesario, con garaje y piscina, además de barbacoa. Pasamos una semana genial! No hay nada nuevo que decir porque la casa es igual que en las fotos: Está muy bien equipada y muy bien situada. La terraza superior es una maravilla. Y el propierario es encantador: nos dejó una carpeta con información de la zona y con las instrucciones de los electrodomésticos. Se mostró disponible en todo momento para lo que pudiéramos necesitar. Dias de entrada y salida preferiblemente en fin de semana.